Maj. Gen. Anthony Cucolo, right, said earlier he issued the order in an effort to prevent losing soldiers from active duty. General said he was taking "every measure to preserve my combat power"
Baghdad, Iraq (CNN) -- The U.S. military has dropped a controversial rule that called for punishing soldiers in northern Iraq for becoming pregnant or impregnating another soldier. The updated policy "does not include a pregnancy provision," said Maj. Joe Scrocca, spokesman for U.S. Forces-Iraq. The military also said that any unit must get the permission of the commander of U.S. Forces-Iraq before creating new rules restricting the activity of troops, Scrocca said. Maj. Gen. Anthony Cucolo created the rule about pregnancy, covering 22,000 people under his command in northern Iraq, including 1,682 women. Cucolo said he designed the rule to make his soldiers "think before they act." It prohibited "becoming nondeployable for reasons within the control of the soldier," including "becoming pregnant or impregnating a soldier ... resulting in the redeployment of the pregnant soldier." Cucolo made the rule part of General Order No. 1. While violation of any rules in the general order could lead to court-martial, Cucolo insisted that he never intended such a drastic punishment for pregnancy. All units have a general order that outlines a code of conduct. Commanders have been allowed to add to those rules but not allowed to make the rules any more lax. But in an e-mail Friday to CNN, Scrocca wrote that from now on, "all requests by subordinate units to impose further restrictions of activities addressed in General Order No. 1 will require approval of the USF-I commander." Cucolo had no immediate response. His division said he was spending Christmas Day visiting soldiers. "It is our understanding that there will be no subordinate command general orders below United States Forces-Iraq. 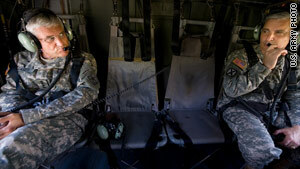 Therefore, as soldiers we will comply," Maj. Jeff Allen of the Multi-National Division North wrote in an e-mail to CNN. Defending the rule last week, Cucolo said he alone would decide each case based on the individual circumstances. To date, he said, there have been eight cases of women getting pregnant while deployed under his command. Four were given letters of reprimand that were put in their local files, which means the letters wouldn't end up in their permanent files and they wouldn't be a factor under consideration for promotions. The four others found out they were pregnant soon after deployment; no disciplinary action was taken since they were not impregnated while deployed. In all cases, the women were sent back to the United States for medical care, as is military policy. Each has the right to submit a letter in her own defense to be included in her file. Of the men involved, three were reprimanded, Cucolo said. One, a sergeant, was given a more severe punishment of a written reprimand in his permanent file because he fraternized with a subordinate and committed adultery. A letter in the permanent file can affect a person's career because it is evaluated when a service member is considered for promotion. A fourth man was never reprimanded because the pregnant soldier refused to identify who the father was, and Cucolo did not pursue the issue. Cucolo said he expected some controversy. "But I was also willing to deal with this attention because this is important," he said. "I am responsible and accountable for the fighting ability of my task force. I've got to take every measure to preserve my combat power, and that's the reason."